The smartly dressed young woman scribbles some percentages onto a board. As she talks about excel spread sheets, due diligence, final contracts and $10m (£6.9m) deals, about 40 men sit in rows behind her listen intently and take notes. It may sound just like any other business school class, but the students are surrounded by the high fences and razor wire of the Cleveland Correctional Facility, just north of Houston. Four years ago Catherine Rohr was a venture capitalist on Wall Street. Then she left her job with its six-figure salary and decided to create the Prison Entrepreneurship Program, or PEP. Since then she has shared her professional experience with almost 400 inmates. It all started when Ms Rohr was invited into another Texas prison by a fellow executive from her church. At first she was not very interested. "I didn't know any prisoners personally, but I thought 'just lock 'em up and throw away the key'," she says. "I saw them as a waste of tax dollars. I was very brutal in my approach." But Catherine then recognised that many were ordinary human beings who had made some serious mistakes in their lives. She also spotted something else, something missed by the majority of prison visitors, namely the men's 'ROI' or return on investment potential. "It wasn't just their potential, it was their proven abilities", she says. "They understand basic leadership and management principles, profitability. "They don't all understand risk management as well as they should because they all got busted when they came to prison, but when it comes to execution and marketing - they get it." Felipe Dias is a former member of the Mexican Mafia now studying business. Ms Rohr realised that influential convicted felons could be America's most overlooked talent pool. Felipe Dias is one of the convicts Catherine plans to redirect into a legitimate enterprise. He was once a lieutenant of the Mexican Mafia gang and made tens of thousands of dollars a month importing drugs and selling firearms and stolen cars. I ask the soft spoken, heavily tattooed man what made him capable of leading 800 gang members. He looks me straight in the eye and replies: "When I made a decision it was a firm decision. I had to use investigative skills. "You see, before you hurt somebody or you promote somebody in the gang you have to investigate everything from A to Z. You cannot leave a single stone unturned." But how do you make men like Dias channel their energies and skills into a more positive and legitimate direction? Like many people, Ms Rohr is familiar with The Wire, an American TV series set in gritty west Baltimore, which shows how the drug trade explicitly follows the rules of capitalism. One of the characters, a high ranking dealer attends evening classes at a business school to learn the rules of running an enterprise. "Our goal is not to turn a good crack dealer into a better one", she says. "We aim to transform the whole personality". Dias says he wants to start a tailoring shop when he gets out as he has learned to sew recently and often alters prison uniforms, including those of the guards. But will such a modest enterprise really satisfy him after years of highly lucrative crime? "I've made a decision that I will start from nothing", he says. "Sometimes when I am in my cell I tremble from fear because now I know I have to do everything the right way this time around." PEP has created a network of top executives and business schools around the country to help the inmates achieve the American dream. 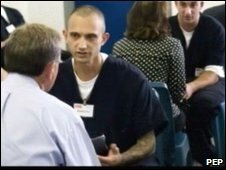 Prisoners get advice on business plans, operating budgets and market research. They learn to make elevator pitches in front of millionaire executives and Harvard students. Most funding comes from individuals and private foundations, but the scheme also receives donations from corporations. John Jackson, an oil pipeline boss, got an award for his work with PEP from President George Bush last summer. In his sleek high-rise office, he explains how he began thinking about the plight of ex-cons after his own brother was convicted for drink driving and couldn't get a job on his release. He says many businesses would like to give felons a chance, but they are afraid of the risks involved with a 50 to 70% national reoffending rate. "The beauty of PEP is that there has been an extremely rigorous programme up front", he says. "You can come into the prison and see these guys who have really worked hard to do a business plan and they have expressed a sincere desire to change. "So employers can take a chance on an individual but it is not just a random chance." 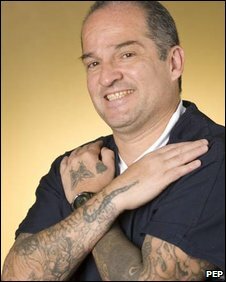 Jimmy Vigil was sent to Texas in 1999 to find new members for the Milwaukee Kings, the biggest Latino crime syndicate in Chicago. At first he enjoyed the power and the money, but he was convicted of attempted murder, sent to prison and the glamour of his street life faded and he began to feel remorse for his actions. Vigil saw a PEP flyer on the prison notice board, signed up and four months later he got an interview. After all, he did have experience in sales and recruitment. Following an intense screening process of 1,100 applicants from 65 Texas prisons, he was one of 69 selected. "I felt truly blessed to be one of the 69," he says. "They give you a clean slate. They don't look at you as a felon or a convict or somebody who does wrong. They look at you as someone with potential." But staying the course is tough. Usually only two thirds of the class will graduate. Some drop out because they cannot handle the peer-driven character assessments. Others cannot manage the workload, with 40 exams in 17 weeks. The programme's reoffending rate, admittedly based on a carefully selected group of students, is less than 5% and Ms Rohr is determined to keep it that way. Entrepreneurial success stories include a man who served 10 years for leading a cocaine ring and is now running a tree trimming company with a turnover of more than $1m a year. Another man, who served a 30 year sentence for multiple murders, got out aged 55 and is now profitably producing leather purses, belts and Bible covers. Some 43 of the 370 graduates have started their own businesses. But Catherine says she is also proud of those who come out, manage to hold down steady jobs and become taxpayers rather than tax consumers. More than 97% are employed at an hourly rate of about $10.50 within four weeks of release, well above the American minimum wage. Troy, a PEP graduate, did not have many roles models when he was growing up. His mother was an addict who died of an overdose and his elder brother is still selling drugs, but he decided he wanted to take another path. Now he has completed his sentence and has just opened a car repair workshop in South Houston. "When I was young I thought it was cool to sell drugs and cool to be violent," he says. "It took a lot of beating my head against a wall to realise that wasn't right. With PEP I had somebody to believe in me and mentor me and coach me for the first time in my life." Proudly he shows me the new weapons he has to help him go straight; a box of tools and an air impact gun for changing tyres. Then I notice the banknote taped to the door. 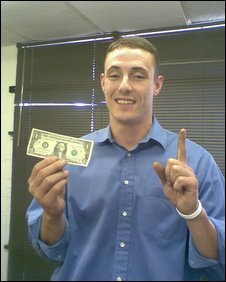 "It's the first dollar I earned," says Troy with a grin. "I guess I ought to frame it." You can hear Lucy Ash's full report 'Fresh Start' on Monday, 16 February 2009 at 09.00 GMT on the BBC World Service.